Lately I’ve been totally consumed by menswear-inspired looks. Sleek separates, slouchy shorts, easy tees and more have been popping up more and more into my Outfit Envy Pinterest board and I can’t get enough of it! While perusing the Friends & Family sale at Theory a couple weeks ago, I discovered this pair of slouchy, masculine shorts and was itching to try out the look. They’re a classic fit and basic black, which makes these shorts easy to style year-round. Here, I’ve style them for a more dressed up look with heels and a sleek blazer (perfect for a work event, right? ), but I’ll definitely be pairing them with tanks and sneakers this summer for a more relaxed vibe. How would you wear the menswear trend? You still very feminine in your mens inspired shorts. Very pretty and polished look! Love this outfit, it looks so chic and stylish. I certainly share your love for menswear inspired pieces. This look is no exception. 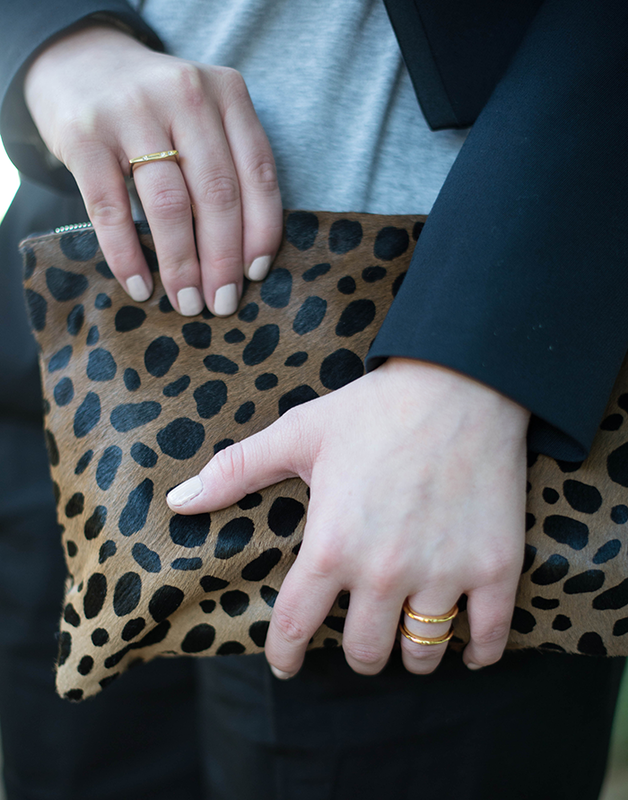 I adore that blazer, and your delicate gold rings are perfect. Totally agree with you – I’m always a sucker for a good menswear look! Love the length and draping of these shorts! The “borrowed from the boys” look is quickly becoming a favorite of mine! New clutch? Love! Such a fun post! Love the look! love this, the shorts are so pretty not boring long chinos at all, great look! I love anything that’s menswear inspired! Those slouchy shorts paired with heels and a leopard clutch are the definition of laid back chic. Great look! 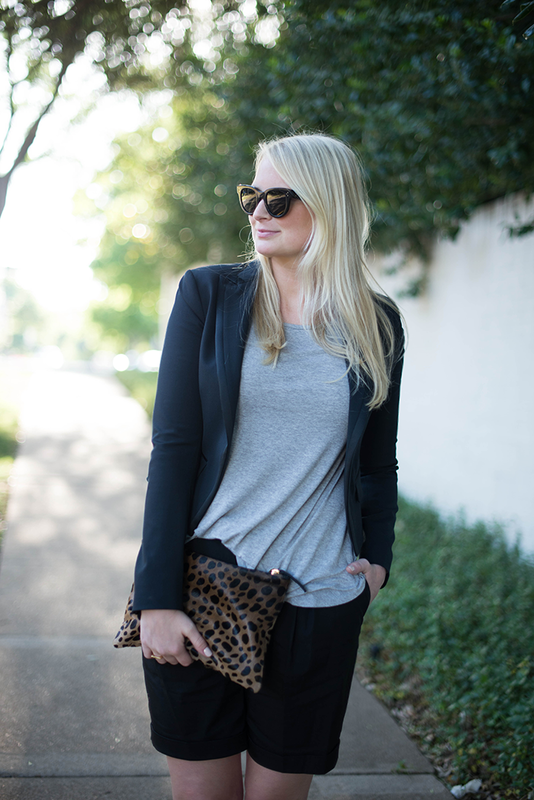 Love the slouchy top & leopard clutch. Great outfit! I love this blazer and clutch! I’ve been really in to boyfriend jeans lately — this post has me thinking I need to check out a shorts option for summer! I can never pull off menswear inspired look (just think they look silly on my petite frame) but I love this look on you and that CV clutch is just so chic! Cute and comfortable, which I love in these hot Texas months to come. i’ve been loving the menswear look! which is so strange because I’ve always been SO girly in my style. I think the mary kate and ashley converted me… love this look! Loving this look, absolutely perfect. great outfit, not too fancy but cute, fun and stylish! Great look!!! Love that blazer!! Happy Hump Day!!! xo. Amazing clutch! Love how simple and elegant this outfit is! Love this look!! One of my favorites… So flattering and different. 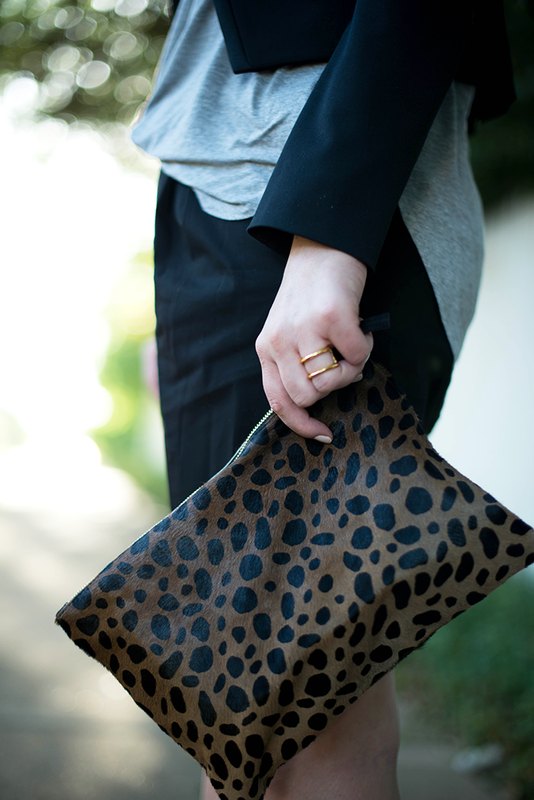 Still dying for that Claire Vivier clutch. When I first got married I would always wear my husband’s shorts and tees around the house. So comfy! I love menswear! It’s always about the detail and I love how you have picked the perfect shorts length to channel that overall effortless styling! I love those Celine glasses! Can you please share which model they are? Am a new follower and live your style and blog.